The homeowners hoped to get their home on the market soon so they needed a quick solution for their basement troubles to really boost the value of the home. 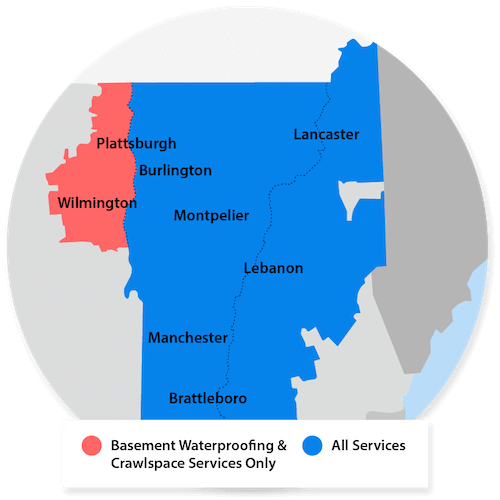 The homeowner contacted Northern Basement Systems with concerns regarding his concrete block foundation with leaks, that were causing his basement to flood. A homeowner contacted us with concerns about his flooding crawlspace. This homeowner called Matt Clark's Northern Basement Systems looking for a solution to his flooding basement. Water seeping up through the floor near the support pole and raising concerns for the homeowner. This homeowner in Randolph, NH contacted us looking for a solution to the water leaks in her basement.